This year is slightly different. I didn’t buy much pens. Actually to date as I write this (19th November), I’ve only purchased 6 fountain pens this year. It’s a little hard to have a top 5 when I only got 6 pens in the running. Considering one of them is a Lamy Safari, I didn’t think it’s fair to put the rest in the top 5. So, to make things slightly fairer, I am going with a top 4 instead this year. Like the top 5 inks of 2017 list, the criteria to make it onto the list is simple. Firstly, I must have made the purchase of the pen during the year. And, I’ve used it and loved it. This is one pen that I’ve used the longest out of the bunch. I got this very late last year but I consider this a 2017 because I didn’t use it long enough to evaluate it for last year. The 1912 is my first Montblanc fountain pen and I really enjoy the retracting nib feature. The weight is really solid and the nib writes really well. Though the barrel scratching cap is somewhat of a let down, it is still a classic fountain pen. This is the 3rd year in a roll that I have a Nakaya fountain pen on the list. This one is the cracked finish which I had been lusting after ever since I’ve discovered the brand. What drew me to the pen is definitely the cracks. It’s like stonewashed jeans, this is breaking the finish of the pen while it is brand new. It is a striking pen for sure. I went with the M nib for this pen. The nib writes as well as can be expected from Nakaya. Review coming soon. What sorcery is this? A TWSBI ahead of a Montblanc and Nakaya fountain pen? The secret here is the nib grind. I had Sunny of Straits Pen to mod the nib. I went with a right foot oblique medium grind at the suggestion of a friend and boy did it open my eyes. Line variations, crisper lines and all that for a lefty! This is my first Aurora fountain pen and I went immediately for the Optima Red Demonstrator. I love my demonstrator pens and I have a soft spot for those with a tiny bit of colour. The Aurora Optima Red Demonstrator ticked all the boxes and then some. Aurora offers factory nib grinding without any additional cost so I went with the right foot oblique fine. Wow, the nib, just wow. It has a very tiny sweet spot but when you hit it just right, it is like flying. No tooth, just pure smoothness with crisp line and line variation. It’s that time of the year again. My top 5 favourite ink purchases this year. Same criteria as last year, this has to be an ink new to the my collection. It doesn’t have to be released this year. Onto the list! KWZ inks are new to me this year. I’ve tried Menthol Green and enjoyed it so I decided to explore their catalogue. I picked up two inks and Brown Pink was one of them. Brown Pink is a wonderful strange mix of well… brown and pink. It is a rather lovely hue of purple that shades nicely. Review coming soon. Cherry is the other KWZ I’ve picked up. I must say I’m great at picking new inks! 2 out of 2 are winners. Cherry is a bright red ink that really reminds me of Christmas. Normally, red isn’t my go to ink in general for anything but Cherry is the exception to the rule. It has supplanted Montblanc Velvet Red as my go to red ink of choice. Review coming soon. Lamy Petrol is Lamy’s 2017 ink that matches the Lamy Safari Petrol. It’s a dark teal colour. In general, I really enjoy teals. Lamy Petrol is one of those inks that works best with a broader and / or wetter nibs. It’s dark enough for corporate use yet retains enough colour for the inner fountain pen nerd. Robert Oster Signature Inks is the other ink maker that burst into the scene this year for me. I’ve reviewed a lot of Robert Oster Signature inks. Among them, Cherry Blossom is one of the stand out colours. It’s a dusty pink that straddles the line between bright and muted. I really like how it isn’t in your face bright but yet is still obviously pink and not some kind of red or purple. Finally the winner of 2017 top 5 inks is Robert Oster Siganture Sublime. I have to credit GlennHK for introducing me to this ink. It’s a really nice shading yellow-green inks. This has been a year of yellow-greens for me. I’ve tried Robert Oster Siganture Jade, Monteverde Olivine, Sailor Jentle Waka-Uguisu. Sublime takes the cake. It’s bright, it shades in all nib sizes. What more can I ask for? Starting off at number 5 is Pilot Iroshizuku Ama Iro. I love the bright blue that pops off the page. I must get myself a larger bottle. Next up at number 4, Sailor Kobe Kaigen Grey. As you can tell the hold Sailor has on my favourite inks is still tight. This is a custom ink that Sailor makes for Nagasawa Stationary in Kobe. The grey is dark but still has some shading properties. Now coming in at number 3, J. Herbin Emerald of Chivor. 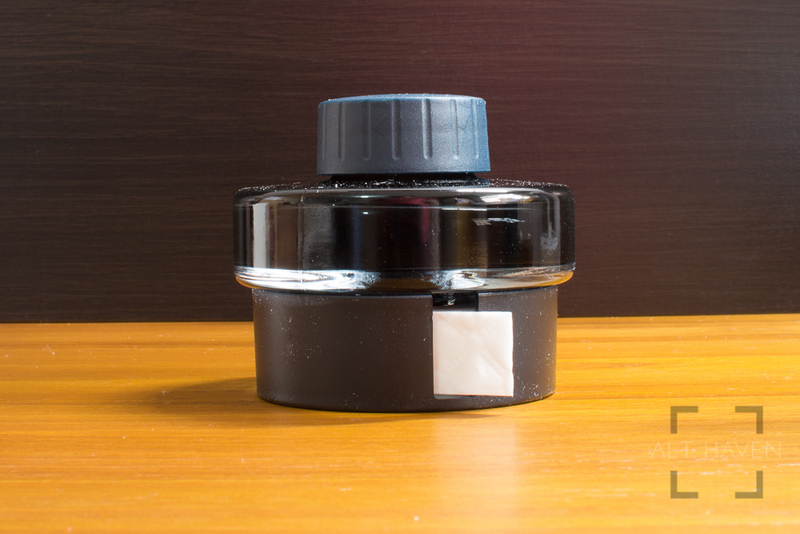 This is an ink that has swept the fountain pen world. The sheen! The gold! The colour! At number 2 is Sailor Maruzen Athena Sepia, another ink made by Sailor for Maruzen. This is one ink that I still do not have a bottle of. I hope I can correct that next year. The deep dark brown is beautiful. The ink runs a little wetter than I like but I just can’t say no to the colour. Right at the top of the list is Sailor Bungbox L’Amant. I am sure many of you are familiar with Bungbox inks. This is made by Sailor for Bungbox, a stationary store in Hamamatsu, Japan. This ink has wonderful shading. It goes from purple to almost pink-ish. The colour is just stunning. Based on my list this year, I can see how my taste shifts slightly towards colours that are darker. Though I still enjoy bright inks, the addition of the Maruzen Sepia and Kobe Kaigen Grey shows a shift in my taste, I think. The number one property an ink could get my attraction is the shading it has. Of course, it must work well with my pens and not have too long a dry time. 2015 is coming to an end. It’s time for my top 5 favourite pens. Starting off the list is my trusty Platinum 3776 Century. I got mine in Chartres Blue. Though I am never a fan of gold furniture, I thought the blue body plays off well with the gold accents. The nib is smooth with a tiny touch of feedback. I love how the pen feels in my hand. Next on the list is my beloved Pilot Murex. I was torn between the Myu 701 and the Murex but I settled for the Murex because I use it more often than the Myu 701. This pen took a little effort acquiring but it is well worth the effort. The integrated nib is a real beauty. Lamy 2000 takes the 3rd spot on the list, it is an iconic fountain pen. I love it for its looks. I love it for the way it feels on my hand. I love it for the way it writes. My Lamy 2000 recently came home to me after 4 month away in Germany to get a loose piston knob tightened. I am very glad that it is get home with me. Coming in at number 2 is my Sailor Pro Gear Imperial Black. I have gone back and forth trying to decide if I should buy the pen. I knew I wanted the pen but the price put me off at first. However I gave in and purchased it. I have no regrets buying the pen. The 21k nib is hard as a nail but I love it that way. The Imperial Black’s stealthy good looks is hard to beat. At the top of the list is my brand new Nakaya Decapod! I am quite sure the new-ness has something to do with its position on the list but the Nakaya Decapod stands on its own merits. The soft medium nib is a delight to write with. The urushi body looks beautiful and feels great, especially after polishing it with a cloth. A review of this pen coming soon. Well my list almost exclusively consists of pens from Japan. Plus the average price of my favourite pens have definitely gone way up compared to the same list of 2014. Maybe this is a result of having the ability to buy and try many different brands. It has honed my taste and helps me discover what I like and don’t like about different pens. Keep an eye out for my top 5 favourite inks coming next Tuesday.